One of the curious (and annoying) things about researching the early Jewish history of the city of Hebron is the dearth of material evidence discovered thus far. Hebron, long considered to be one of “The Four Holy Cities” in Judaism (along with Safed, Jerusalem and Tiberias) may have been only sparsely populated by Jews during most of its history. One of the reasons for that may be because of a lack of water resources; there are only several small springs in the area (an aqueduct providing an abundant water supply to the area was not built until the Mamluke and Ottoman occupations of the area). Yes, David’s original kingdom was established there (where ‘there’ is exactly is a question that archaeologists are still trying to figure out). 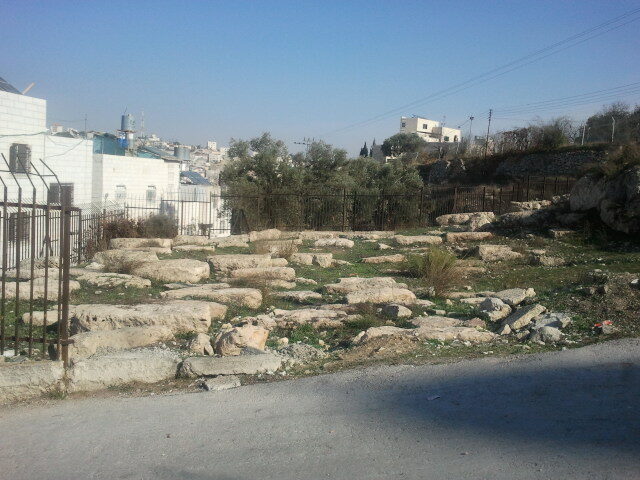 Various theories have been propounded as to where the Biblical Hebron was situated exactly. The current consensus among scholars is that it was at a place called Jebel Rumeida. The strategic location of the site; it’s topographical advantage (it oversees a major intersection that runs from Beersheba in the south and Jerusalem in the north). 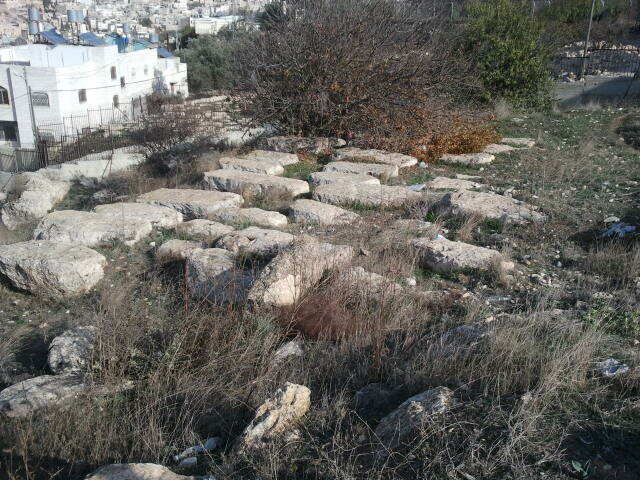 As early as 1970, Professor Benjamin Mazar was convinced that Jebel Rumeida (or Tel Rumeida) contains within it the remnants of ancient Hebron. Archaeological excavations have been conducted in the area shortly after Mazar published his paper and are still ongoing. I don’t want to focus on the history of the Jews of Hevron during the Biblical Period or The Middle Ages (also referred to as The Geonic Period) in this post (look out for another post on the subject in the near future) but rather focus ON ONE curious fact about the city. There is an ancient cemetery in the area of Jebel Rumedia which would have been a goldmine for researchers had it not been for one “annoying” fact: apparently there was an ancient custom among the Jews of Hevron not to inscribe names or dates on tombstones. As a result we have a collection of slabs of anonymous chiseled stones. The terrible massacre of Jews by the local Arabs in 1929, saw the destruction of large parts of the cemetery, a road was built right in the middle of it and parts of it were used for agriculture and construction of houses. When the massacre of 1929 occurred, there was a question regarding engraving the names of the dead. A query was sent to Rav Kook, then Chief Rabbi of Jaffa. He replied in no uncertain terms that this case was an exception and that the graves should be marked “so that it also stand as an eternal remembrance of the horrific crime that occurred”. This courageous Halakhic decision enabled the Jews to recover some of the remains of the murdered (whose tombstones were shattered and their remains scattered in the period 1948-1967) when Israel re entered the area after the Six Day War in ’67. למרות המנהג שהיה מקובל בחברון לא לכתוב שמות על המצבות, הורה הרב הראשי הראשון לא”י, הראי”ה קוק זצ”ל, לכתוב שמות על מצבות חללי תרפ”ט כדי לזכור את האירוע המחריד. הוא כתב: “הצרה שבאה עלינו ע”י הרוצחים הטמאים ימ”ש, שהוא דבר נורא ואיום שלא נשמע כמוהו בארצנו הקדושה מימי החורבן, לא שייך לגביו תוכן של מנהג, וחובתנו היא לחקוק לזכרון עולם את המאורע הנורא עם שמות הקדושים הי”ד…והשי”ת ינקום לנו מצרינו, וחרפת צוררינו אל חיקם ישיב, וירים רן עמו ונחלתו בב”א..”. הוראה זו אפשרה לשחזר חלקה זו אחרי שחרור חברון. This is also mentioned in the book דרכי חסד מאת הרב יצחק אושפאל. See here He claims that this is based on the famous passage (also quoted by Rambam in Hilkhot Avel) from the Jerusalem Talmud, Tractate Shekalim: אמר רשב”ג אין בונין נפשות לצדיקים דבריהם הם זכרונם, which I discussed in my post about praying at graves. Back to the anonymous tombstones. From whence did this strange custom originate? It is certainly neither a Rabbanite nor Karaite custom, for we don’t see anything of the kind in any of the other graveyards belonging to either (in fact one of the largest graveyards outside of Israel is the Karaite necropolis of Chufut Kale, about which I blogged about here). It is the first time I see it mentioned as an ancient custom of the Arabs from the area (meaz umitamid..), so I put forth my modest proposal that this was an non-Jewish custom, probably followed by the Mustara’abin, down to to the 20th c.
Photos of the Karaite portion of the cemetery-which is the best preserved section. Reblogged this on Meiras World. « Is the Tet. Offensive On a Tombstone?